Amy Gumm is a teenage girl from Kansas who lives in a trailer park and dreams of leaving her rundown town of Dusty Acres far behind. Between going to school, dealing with a pregnant teen bully and looking after her mother (who is battling depression and an addiction to pills), Amy doesn’t really have a lot going for her. To make matters worse, her mother decides to abandon her to go on a bender just before a tornado comes roaring through the caravan park, taking the trailer and Amy with it. Miraculously, Amy is uninjured when the flying trailer comes to a stop on the edge of a vast ravine, but it seems that she also isn’t in Kansas anymore. In an uncanny twist (literally) of fate, another Kansas girl has ended up in the magical land of Oz via cyclone transportation. Amy, of course, knows all about Oz, having seen the film and read the book as a child, but it is unlike anything that she ever expected. Evil has taken over the once prosperous land, and the people now live in fear of their ruler- the once beloved and now reviled ‘Princess’ Dorothy- who is intent on stealing all the magic in Oz to make herself the most powerful. Glinda the Good has changed her ways and Dorothy’s three pals- the Tin Woodman, the Scarecrow and the Lion- have become brutal and cold-hearted killers, doing what they can to help further Dorothy’s cause. As the newest recruit for the Revolutionary Order of the Wicked, Amy is trained in magic and warfare, and given the role of assassin. 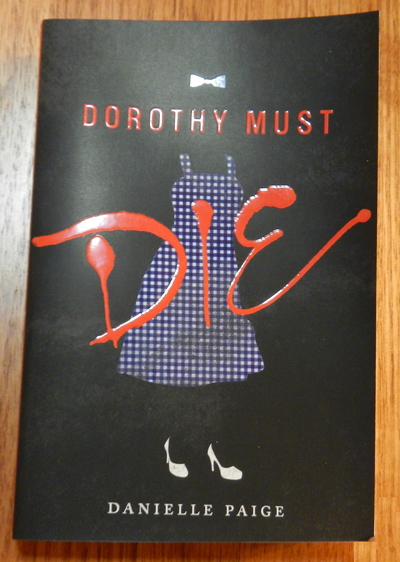 The Order only has one goal in mind- Dorothy’s death. They believe that Amy’s arrival in Oz as someone from the Other Place is a sign that she is meant to be the one that ends Dorothy, and, in effect, ends her tyrannical rule over the land. But does Amy have what it takes to be a killer? Will Oz ever really go back to normal? With the assistance of a few mysterious boys, a rebel Munchkin, a self-mutilated flying monkey and a coven of witches, Amy soon learns that she can trust no one in this new and cruel Oz, and that she must keep her wits about her if she wants to survive. Sounds like a fun book. Have ever read any of the other Oz books? There are about 30 canonical ones, including those written by L. Frank Baum and those by other writers licensed to write books in the series after he died. A lot of people think that Geoffrey Maguire and other modern authors have added a darker element to Oz but I reckon it was really there all along to some extent at least. They're cracking good stories anyway, with Ozma, the queen of Oz who is raised as a boy (not disguised as one, she is literally turned into a boy and grows up that way) to keep her hidden until the time came to reclaim her throne, Tik-Tok the clockwork robot, another queen who keeps a cabinet full of heads she can swap for her own to match her outfit etc. There's also an anime series from the 80s which is pretty true to the books which is well worth watching if you can get hold of it.